It’s a whole new year! Consider supporting Data Stories on Patreon! 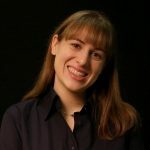 Michelle Borkin is Assistant Professor at Northeastern University where she studies the use of visualization in science research, in particular how it impacts human perception and cognition. On the show we talk about how the data viz community can better support the work of scientists, her popular research on data visualization memorability and, of course, the infamous data viz dinosaur.